The Highlands condominiums shortly after construction. Image: Canada Science and Technology Museum, CN Collection. CSTM-O-521-4. Though an award-winning project, the Highlands condominium on St. Laurent seems unremarkable – at least in style – to most. Indeed, in spite my own enthusiasm for this brown brick beauty, I’ve more often than not found that most seats on the bandwagon go unfilled. The same cannot be said for the people who have lived in the Highlands, however. Be it the case that they are current residents or past residents, all of those I have spoken to have shared fond memories related to it. To be certain, while tastes change, Irving Grossman’s early 1970s design has stood on its own. 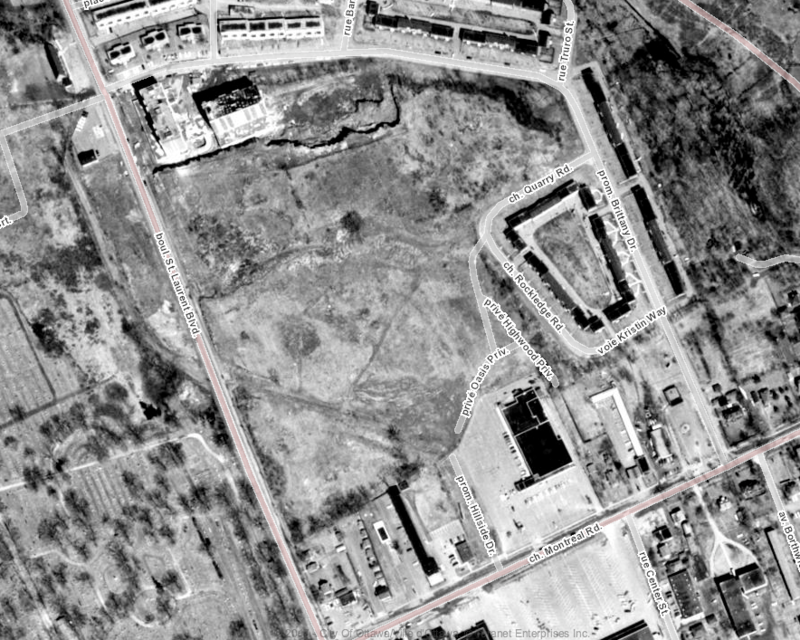 The 26 acre site, as it appeared from above in 1965. Image: geoOttawa. During the warm Summer of 1970, Ottawa was introduced to Wesman Holdings and Wesman Property Management, newly-formed companies that would develop and mange residential projects in the area. The new company seemed to promise big things in development: as a partnership between Wesley Nicol of Ottawa and Toronto’s Irving Sussman and in collaboration with the Canadian National Railways Pension Trust Fund, it was poised for success. In what would be the first of a small number of published teasers, the advertisement noted that the company was “the owner of 26 acres of property, located on St. Laurent Boulevard, north of the Montreal Road.”1”Announce Formation of Wesman Holdings Limited,” Ottawa Journal, July 10, 1970, 11. 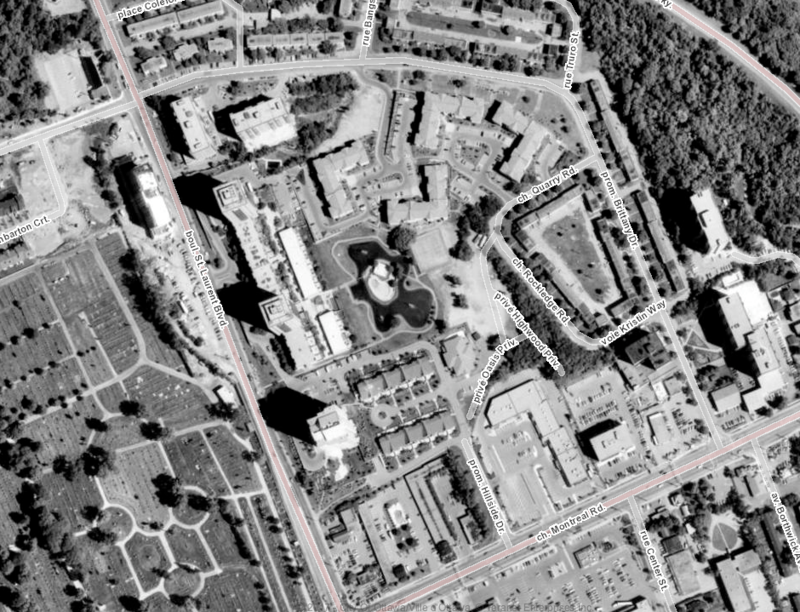 One of the largest residential developments to be constructed in the Ottawa area. Five days following Wesman’s birth announcement, another teaser of sorts was run in the Journal. Nicol was not yet ready to divulge more details about the project, other than to claim that it was going to be “one of the largest developments to be constructed in the Ottawa area.”2”New Project Soon to be Announced,” Ottawa Journal, July 15, 1970, 11. After a few teasers, plans for development were announced. Source: Ottawa Journal, July 29, 1970, 3. Wesman Holdings unveiled its 8-phase $45 million project on July 29. 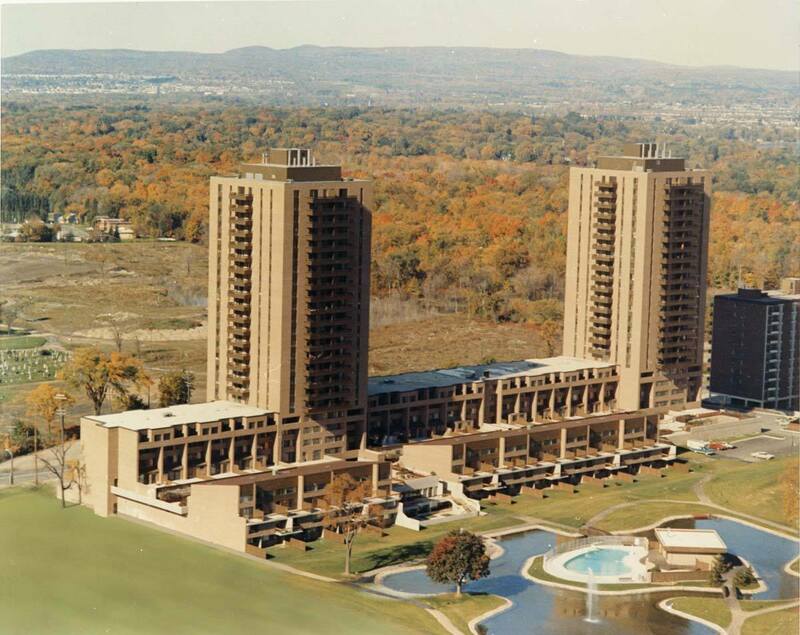 The first – and most dramatic – phase was to consist of two 24-storey towers linked by a six-storey terrace perched atop the hillside and on the T. Sidney Kirby (Rogers and Kirby) quarry that had once occupied the 26 acre lot.3Ottawa Journal, July 29, 1970, 3. For more about the quarries in the area, see Glenn Clark. “The Hamilton Powder Company Controversy,” Historical Gloucester 12, no. 2 (2011): 6-7. In spite of the plans being announced and the marketing being prepared, by the summer of 1970, mortgage financing for condominiums was not, to say the least, plentiful. While Minto’s Horizon House on Meadowlands and the city’s two other rowhouse-type condos were a resounding success, institutional lenders were not entirely quick to get in on the game. When asked by the Journal’s Robert Mahaffy, Robert Nicol (R.J. Nicol Construction was contractor for the project) answered that funding for the $45 million project was sourced from both Toronto and Ottawa interests as well as the CNR’s pension fund. It was expected that future developments would not have to go to such lengths, however, with chartered banks and trust companies were signalling interest.4Robert U. Mahaffy, “The Condominium Scene,” Ottawa Journal, August 8, 1970, 9. The logo used by The Highlands. It is still visible and still every bit as delightful. Construction on the first phase began that summer and on September 22, Ottawa mayor Ken Fogarty participated in a sort of christening ceremony during which a time capsule was placed in a block of cement in the building’s construction. The development’s name – The Highlands – was also announced. 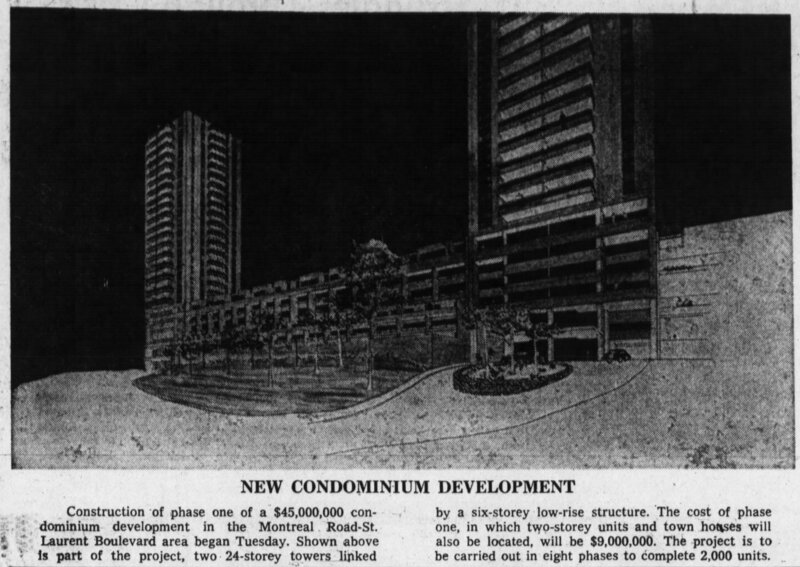 Units were to begin at about $20,000 and move up from there and the entire project was expected to be built out in 10 years.5 “Mayor Buries Time Capsule In Latest Housing Project,” Ottawa Journal, September 23, 1970, 3. Source: Ottawa Journal, December 18, 1970, 3. In the meantime, The Highlands garnered attention elsewhere. The Irving Grossman design won a Canadian Architect Yearbook Award for 1970 as an outstanding project.6 “Award Winner,” Ottawa Journal, December 18, 1970, 3. The award came at the right time for Wesman and it was used extensively in the development’s marketing materials. Below is a reproduction of a 12-page insert for the condominium that was placed in the Ottawa Journal. Construction appears to have been completed roughly on time for Phase 1: units were advertised as being ready for occupancy that October. Source: Ottawa Journal, July 28, 1971, 56. Source: Ottawa Journal, January 2, 1973, 35. After the first phase was completed, it does not appear that any additional construction took place. Given the rapid deterioration of the economy that began in the mid-1970s, it is probably not surprising. It might have also been the performance of The Highlands specifically or the willingness of the Toronto interests to continue. Nicol, after all, did continue to design and build housing projects until well after the completion of The Highlands. The site was eventually filled in, but not as The Highlands. Image: geoOttawa, 1991. There is very much more to the Wes Nicol story than the Highlands, of course, and I intend to go into that at a later date. From the Westcott Building at 309 Cooper in Centretown, to the Faircrest Apartments at Riverside and Smyth, and the formation of Tartan Homes, Nicol’s Ottawa legacy is a large one. 1. ↥ ”Announce Formation of Wesman Holdings Limited,” Ottawa Journal, July 10, 1970, 11. 2. ↥ ”New Project Soon to be Announced,” Ottawa Journal, July 15, 1970, 11. 3. ↥ Ottawa Journal, July 29, 1970, 3. For more about the quarries in the area, see Glenn Clark. “The Hamilton Powder Company Controversy,” Historical Gloucester 12, no. 2 (2011): 6-7. 4. 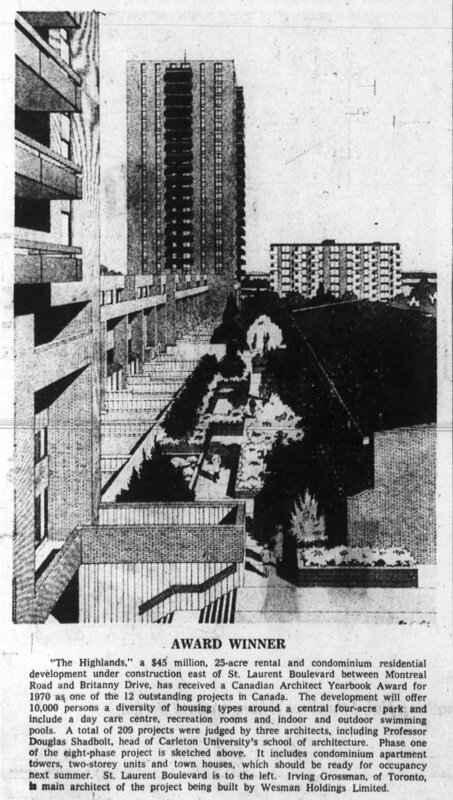 ↥ Robert U. Mahaffy, “The Condominium Scene,” Ottawa Journal, August 8, 1970, 9. 5. ↥ “Mayor Buries Time Capsule In Latest Housing Project,” Ottawa Journal, September 23, 1970, 3. 6. ↥ “Award Winner,” Ottawa Journal, December 18, 1970, 3.